Along with chloride and potassium, sodium is a major electrolyte, which are minerals in your blood, urine, and bodily fluids that contain an electric charge. Your body’s cells use electrolytes to carry electrical impulses throughout your body. These electrical charges help your cells communicate with each other and give you the ability to taste, see, smell, touch, and hear. Roughly 30% of the sodium in your body is stored in the bones, and the rest is found in bodily fluids like plasma, blood, and sweat. So, if you exercise heavily, you actually lose sodium through your sweat. Click here to learn how InsideTracker can recommend personalized diet recommendations based on the amount of sodium in your body! What happens if you don’t get enough sodium? Can you get too much? The body loses sodium each day through urination and sweat. So, if you live in a hot climate or exercise regularly, it’s important to make sure that your body has an adequate supply of sodium. 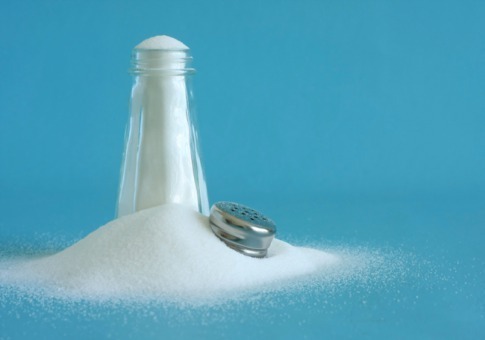 Because sodium is found in so many foods, it’s fairly uncommon to develop a sodium deficiency unless you’re having a bout of excessive vomiting or diarrhea. If you’re losing a lot of water, you’re probably also losing an unhealthy amount of sodium too. Symptoms of an electrolyte deficiency include muscle cramps, fatigue, dizziness, nausea, and inability to concentrate. If the deficiency really becomes serious, the body can go into shock and the circulatory system can collapse. Conversely, if our diets contain too much sodium, our body tissues tend to retain water. This helps to explain why we feel so bloated after eating fast food. Feeling bloated isn’t fun, but there are also more serious complications that can occur from a sodium overload. Consuming too much salt can cause the kidneys to retain water, which can sometimes result in increased blood pressure, stroke, and heart disease. What are dietary sources of sodium? Since sodium helps preserve foods and prevent microorganisms from forming, it’s heavily used in processed and canned goods. You’ll find a high amount of sodium in foods like hot dogs, lunch meats, and canned soup, but healthier amounts of sodium can actually be found naturally! Meat, nuts, seafood, beets, celery, and even milk are good sources of sodium. The 2012 American Heart Association guidelines encouraged people to consume no more than 1,500 milligrams of sodium a day. However, the Center for Disease Control estimates that the average American is consuming 3,436 milligrams per day, which is more than double the new recommendation. African-Americans, people older than 51 years, or individuals with high blood pressure, diabetes, or kidney disease need to be extra careful about their sodium intake because they’re at a greater risk for diet-related heart disease. If you exercise in hot weather, you should aim to consume 0.6 grams (pinch) of salt per 0.7 liters of water every hour to replenish your sodium levels while exercising. Do you really need electrolyte-enhanced sports drinks? If you’re an athlete, you’ve probably heard that you need to replace your body’s supply of electrolytes after a hard workout. But is it necessary to run out and buy a sports drink every time you break a sweat? The answer really depends on how much you exercise. According to the American college of Sports Medicine, people who exercise less than an hour can get by with just plain, old water. For instance, if you exercise in a cool environment and don’t really sweat much, you’re probably not at risk for significant sodium loss. Another thing to think about is that many electrolyte enhanced sports drinks contain added sugar and calories, and might even provide you with more sodium than you actually need! So, whether you’re thinking about purchasing a can of soup or a flavored beverage, be sure to check the label to make sure that the sodium level is not too high!